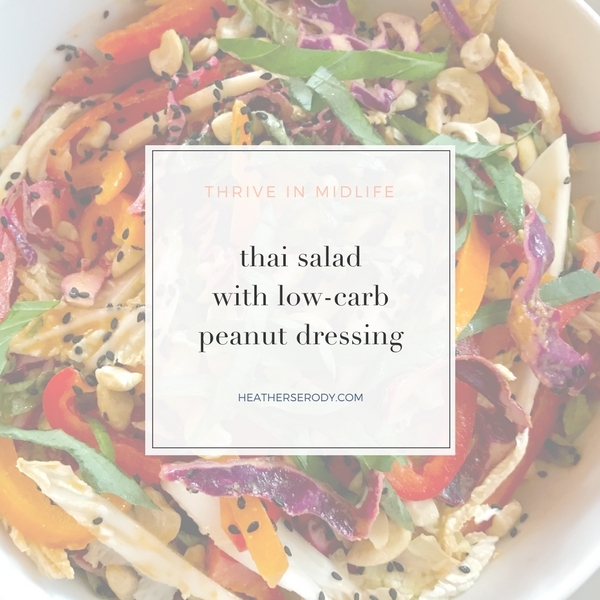 I love a good crunchy Thai style salad with a sweet low carb peanut dressing. Some low-carb & Paleo purists are adamant about avoiding peanuts because the founder of the Paleo diet said so. But for me it's personal decision based on how my body feels and runs after eating peanut butter, which is awesome. I have absolutely no side effects, so I'm all about peanut butter. My advice is to eat it if you feel the same way & can remain true to your health goals. If you're trying to keep blood sugar low, then be sure to test your blood sugar to see how peanut butter affects you. Lots of ‘all-natural' peanut butter brands have added sugars, so be sure you're checking the nutrition information and ingredients list. I buy this brand of peanut butter, and then I just add my own all natural liquid stevia to it to add back some sweetness without carbs. Even better than buying peanut butter is using one of those in-store nut grinders to grind fresh peanuts. Whole Foods has them. These are also usually very fresh peanuts which tastes so much better than jarred peanut butter. To make the salad, add the lettuces to a medium-sized bowl and toss lightly until combined. Puree all the dressing ingredients in a blender until smooth. Taste for seasoning and adjust to your preference. If it's too thick add some water. Pour dressing over lettuce and toss until dressing is evenly coated. Scatter pepper slices cilantro, scallions, cashews, sesame seeds and avocado over top. Serve immediately with remaining dressing.